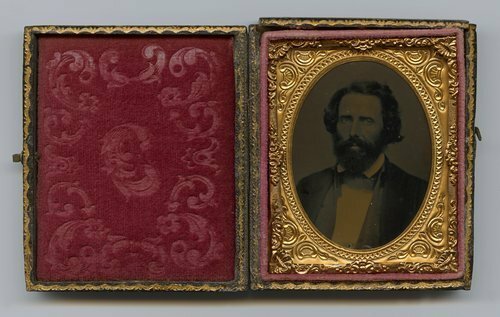 Cased ninth plate ambrotype portrait of James Montgomery, 1814-1871. Montgomery came to Linn County, Kansas Territory, early in the territorial period after living in Ohio, Kentucky and Missouri. He was active in the free state cause and was involved in most of the conflicts between pro-slavery and free state forces in that area. He raised a militia troop that was active in 1857.